No matter how skilled you are at tackling business problems after completing an MBA online, you can’t lead an organization to success on your own. Fortunately, you’ll learn a great deal along the way about how to work with and organize a team. Exploring approaches for effective collaboration and applying them to real-world challenges is one of the most vital parts of an advanced business education. While principles of business operations, strategic management and data analytics are all vital to building a great career in today’s corporate landscape, you must also consider how to enhance your soft skills. Being able to communicate complex ideas in understandable terms and get the best out of a team often makes the difference in achieving lasting success. By understanding the strategies that yield improved group dynamics, you can overcome obstacles and lead the way toward a more efficient and productive organization. The first step in exceptional teamwork is ensuring you have the right people involved in a project. While your level of flexibility in choosing collaborators may vary, it’s essential to begin with a vivid picture of what skills and perspectives will be useful to accomplishing your goals. In many cases, that may mean reaching out beyond a single department to garner fresh ideas and seek expert advice. As Harvard Business Review pointed out, one of the best ways to gain a sense for the value of an outside viewpoint is by joining in on someone else’s project. That way, you’ll experience situations where your thoughts are helpful to the group, and you’ll have opportunities to learn from others. By building an extensive professional network, you’ll also know who to approach when a specialized question or problem comes up in your own pursuits. For collaborators to work well together, they must all have a well-defined understanding of what is expected of them. Knowing what each person brings to the table in terms of skills and experience and establishing their responsibilities accordingly lays the groundwork for the project to move forward. Each meeting should be carefully directed and built around drawing useful input from everyone, rather than aimless brainstorming or discussion. With structure comes productivity and accountability. Establishing specific requirements and deadlines for all team members keeps a project on track. Leaders must be ready to change priorities and shift timelines when circumstances call for it, but they should also be explicit about the consequences for anyone who fails to do his or her part. Teams can only accomplish their goals and minimize redundant efforts if they stay in touch. However, it may not be necessary to hold constant meetings. Part of being a good leader is considering what methods of communication are best for different circumstances. Depending on the project and who’s involved, email, chat or phone might be the best way to provide updates. However you choose to communicate, all team members need to know protocols for whom they are required to keep in the loop and what channels they should employ to do so. Laying out straightforward guidelines from the beginning of the project saves a leader some serious headaches down the line. If you want to get consistently great results out of a team, you must consider the human connections you are making with people. Leaders should both show respect for the professionals they work with and command it in return. In a team setting, individuals demonstrate consideration for each other by showing up for meetings prepared and on time and engaging in polite exchanges of their thoughts. Showing signs of appreciation for what others contribute keeps team members motivated to do their best. Genuine gratitude for people who put in the effort to get a project across the finish line is a powerful force in workplace culture. 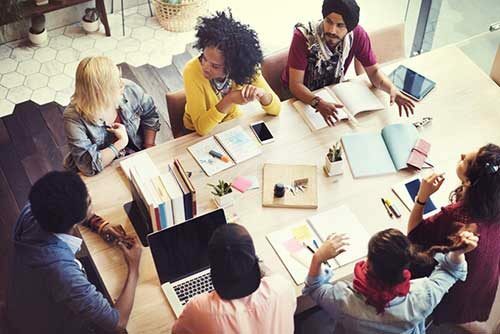 While team members should remain focused on project objectives, they set the stage for long-term success by forming respectful personal connections and building trust. Learning to collaborate effectively is one part of a high-quality business education. Villanova University’s online MBA courses provide students with numerous opportunities to work with others to solve the complex problems of today’s business world. Visit the program page to learn about how the curriculum prepares graduates for exciting careers, and find out how to apply.